Our new AB testing email module enables the highest level of optimization by emailing a limited number of recipients at first and examining their responses. Through a thorough analysis of various parameters, the module then measures the success expectancy and automatically sends the more successful version to the rest of the recipients. This assures that, subsequent recipients will be receiving a mailing that ensures the best possible campaign results. 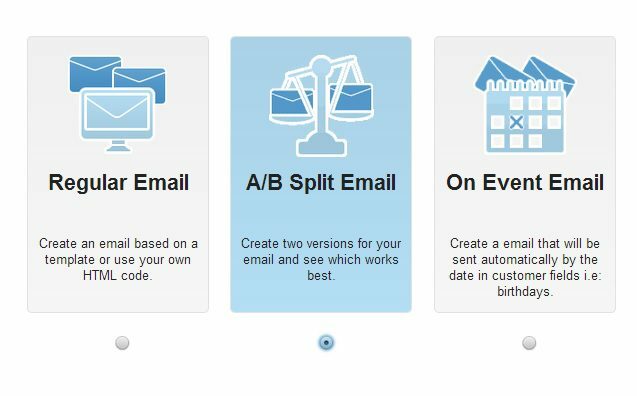 The process of creating a campaign using the split test is fast and simple. After selecting the campaign type, basic details can quickly and easily be defined, followed by the creating of two separate content versions. These will be sent to two different recipient groups. Once definitions have been set for the two campaigns (A & B), parameters can be configured to specify design and content for both versions separately. The next step comprises the set up, with the use of a simple slider, of two recipient groups– with this, set up is complete. The system analyses the two versions and opts for the more efficient one, sending it to all remaining recipients. The test results are listed on the summary page. This screen shows all the parameters tested, as well as the automatic selection of the winning version. In summary: a well-planned email marketing campaign relies on content optimization. Our new AB testing module enables the testing of different designs, on both an aesthetic level and contextual level, in order to create the best possible campaign. The module is among the most advanced of its kind, however, was created with particular attention to simplicity, ease of use and efficiency. Please feel free to get in touch if you have any queries, thoughts or suggestions, we are continuously seeking to improve our product and listening to and learning from our clients is very important to us. We hope that you will adopt this AB testing email module in your work routine. Read more: Yes, We Now Offer 3 Different Types of A/B Testing!